There was the usual sense of eager anticipation among the guests as the banca boat motored out to Honda Bay in Palawan, Philippines for another whale shark trip. I’d been going on these trips for ten years but my excitement was undiminished because of my love of whale sharks, the visual feast they can provide for a photographer, and that every trip was different. I was very familiar with the prospect of unexpected encounters and surprises: the icing on the cake was spinner dolphins riding the bow or a manta ray announcing its presence on the surface. Although it usually takes an hour or more to get to the main feeding locations of the whale sharks in Honda Bay from Puerto Princesa, I knew from experience to be ready for action just in case something popped up along the way. But it’s a very early start and snoozing was always welcome. Suddenly I snapped out of my snooze because the boat’s guide had spotted some commotion in the water ahead: there were several fins slicing across the surface……. 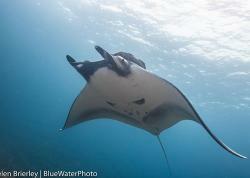 devil rays!!!…. get your fins on! 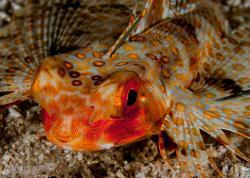 I had good reason to be so excited from previous encounters with these mercurial flapping fish. I have seen spinetail devil rays quite a few times in Honda Bay, often in the vicinity of the whale sharks, but I only managed to get close to them on one occasion when there was a large school of them feeding on a massive bloom of krill; I was mesmerized as they emerged from the murky darkness below and surrounded me like a squadron of fighter aircraft, and then ascended into the dazzling light above like a flock of angels before ploughing through the krill on the surface. On this occasion there was no apparent feeding behaviour as five of them swirled around us. They seemed to be completely oblivious to us in what looked like an underwater game of tag. The guests couldn’t have had any idea how unusual this kind of behaviour was and how exceptionally lucky they were to witness it; I had waited nearly ten years to have another encounter like this! 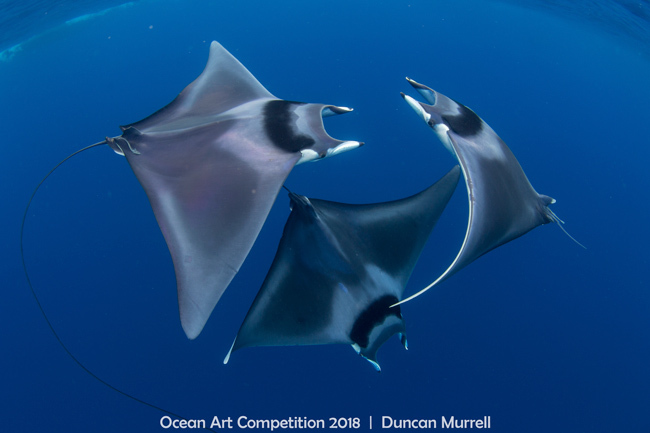 It wasn’t until a few weeks later when my photos were noticed on Instagram by the director of the Manta Trust that it was confirmed that what we witnessed was rarely seen or photographed courtship behaviour. On closer examination of my series of photos, one female was identified as being the object of desire of four males by the bite marks inflicted beneath her pectoral fin. It was very evident that they lose any caution when they are engaged in courtship behaviour and intoxicated by their reproductive desire. The guests may not have appreciated the rarity of this event, but I certainly did even if I wasn’t aware at the time exactly what the behaviour was. I had to quickly get into top gear to keep up with this hypnotic underwater dance performance and avoid the ubiquitous selfie sticks to capture some unique photos. I was quickly reminded why I had fallen in love with these beautiful mobulas during that rare feeding event nearly ten years ago when there were also whale sharks, oceanic manta rays, and dolphins feasting on the krill. It was these devil rays with their graceful flight and luminous white cephalic fins, which gave them the title of devil rays, that stole the show for me. I quickly slipped into the high adrenaline zone and joined this electrifying game of tag. The sea conditions and underwater visibility were good, and there was sufficient light to complement the graceful mercurial curves of these submarine bats. It was fortunate that I was just snorkeling because I could never have kept up with the action if I was wearing cumbersome scuba gear. As they effortlessly swirled and swooped up to the surface I just couldn’t get over how oblivious they were to my presence. That unprecedented sensation climaxed when three of them converged just a few metres in front of me and in a split second created a perfectly choreographed yin-yang formation. And if I wasn’t already gobsmacked enough by what I was witnessing at such impossibly close quarters one of the males suddenly flew right at my head and swept downwards while brushing up against my body! I was absolutely stunned by this intimate encounter; such bravado by a normally shy creature that could have stemmed from aggression, curiosity or just sexual arousal. It was as if I was suddenly included in the courtship and caressed by its sexual abandon. It was undoubtedly one of the most arousing close wildlife encounters of my life! I also wondered if it might have been attracted by the reflection in the glass dome port of my housing because it swam right at my face. The entire encounter with those courting devil rays lasted more than half an hour and left me with an intoxicating sense of incredulity; WOW! Did that really just happen? When we were all back on the boat I was quick to tell the guests how incredibly lucky they were to witness that. I always told the guests on the whale shark trips that there were occasional bonuses like spinner dolphins, turtles, manta rays and devil rays, but on this occasion they had undoubtedly won the lottery! I knew that I had a unique set of photos even if I wasn’t sure of exactly what the behaviour was. I’m first and foremost a conservation photographer going back decades when my photos of humpback whales were used by all of the major conservation organisations for their Save the Whale campaigns. I was infatuated with humpback whales for many years, and the mobulids, including manta rays and devil rays (mobulas), are my new love….. and despair, just as it was when whales were still being slaughtered on an industrial scale. I had already seen the corpses of mobulids in Baja, Mexico and Sri Lanka many years ago when it was probably just for human consumption. Now like so many threatened species, especially the likes of rhinos, tigers and pangolins, mobulids have become the target for massive profiteering in the traditional Chinese medicine market for products that have no proven efficacy making their slaughter even more tragic and pointless. And in the case of mobulids it’s even more disturbing because the demand for their gill-rakers, the thin filaments that mobulids use to filter their food, has risen dramatically in the past fifteen years even though they were not historically used for that purpose. They are sold for up to $500 a kilo as an ingredient for a soup locally called pengyu sai, which is purported to boost the immune system by reducing toxins and enhancing blood circulation. Practitioners have even admitted that gill-rakers are not effective and many alternatives are available. Many young traditional Chinese medicine doctors are not even aware of the remedies that they are used for but still the slaughter continues and all mobulids are under serious threat worldwide. It is inconceivable to me that such mesmerizing creatures as the mobulids are disappearing from the world’s oceans through such human ignorance and greed, and I will do whatever I can do as a conservation photographer, writer and teacher to educate and inform to help to protect these beautiful and highly intelligent creatures that grace the sea like ballet dancers. Cetaceans, whale sharks, and manta rays have been protected in the Philippines since the 90s but devil rays continued to be targeted by local fisheries, especially on the island of Bohol - up until April 2017 when they were protected in response to being listed as endangered on Appendix II by CITES.